When a garage door is stuck open or won’t close, it compromises the security of your property. And, your garage door must functional to maintain optimum security. 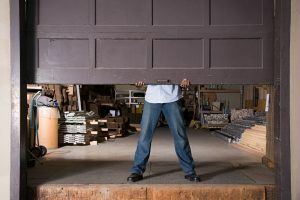 Discover some of the reasons why a garage door fails and what can be done to fix it. What If The Door Won’t Work? Whether you try to open or close a garage door manually or remotely, it is frustrating when the door does not work. So find out more about why this happens. If your garage door springs break, it sounds like a gun or firecracker going off that you’ll be able to hear. Broken garage door springs are the number one reason why garage doors fail to open and close. As a result, if your garage door springs break, call a professional to fix it. And the amount of pressure from the springs makes it dangerous to do yourself. Some garage door openers have a lock or vacation mode. If the garage door is in this mode, it won’t open or close. To enable and disable lock or vacation mode, someone would have to press down on the opener button on the keypad for quite a few seconds. Be sure to check and see if your garage door is plugged in. And if this doesn’t work, check your breaker box because it could’ve blown a fuse. Several wires need to be connected and working for your garage door to open and close. So be sure to check that all of your wires are intact and in working condition. And check that your wires haven’t become damaged or loose as well. If you hear a humming noise when you try to open or close your garage door, the gear in your opener could be missing. It’s possible to replace the gear. But most of the time you’ll need to get your entire opener replaced. And it’s best to let a professional do this. If you’re close to your garage door when you use your remote and nothing happens, check that your remote batteries aren’t dead. When remote batteries start getting old, the remote usually works when it wants to. Even though it’s rare, vandalism can prevent your garage door from opening and closing. If the garage door has been spray painted, the residue from the spray paint could prevent it from opening and closing. And if the door is dented in any way, that could cause problems too. If your garage door gears don’t have any lubrication, it can prevent the garage door from opening and closing. You can lubricate the gears yourself if you’d like. And be sure to unplug it from its power source first. You should do this every three months to keep it in good working condition. Some garage doors have a lock handle on the outside of the door for an added safety feature. As a result, the garage door can become manually locked. When the door is manually locked, it prevents the garage door from opening and closing automatically. If your garage door doesn’t open and close, check the lock before calling a pro. If you have noticed that the springs in your garage have broke, you’ll likely see that your garage door cables broke as well. And if this is the case, your springs and cables need replacement. So in this situation, it’s best to call a professional. Garage doors have a sensor that prevents objects underneath your garage door from being crushed. And garage doors have a reversing mechanism to prevent this from happening. Plus, something as little as a rock or can trigger the sensor. So be sure to take a broom and sweep underneath the garage door regularly to prevent this issue. If your garage door begins to close but then lifts back up, your garage door limit settings may be the trigger. This issue typically happens in newer and older homes. Also, check the knobs or dials located on your garage door motor to adjust the settings. Your garage door runs along a metal track. And the track needs to be properly aligned for the garage door to open and close. The easy way to tell if this is the culprit is to look at the track to see if it’s bending. Also, you need to check to see if there are any gaps between the rollers and the track. If there is, you’ll need to call a professional so that they can fix it. Any of these issues could cause a safety hazard. You’ll need to call a professional to your residence for most of these problems. And you could put yourself in danger if you attempt to fix or replace anything. We offer emergency repairs for serious issues. Also, we have highly trained employees that can help you with any garage door problem you have.